A few more stragglers from my last film round - probably the last ones until I get some more developed. 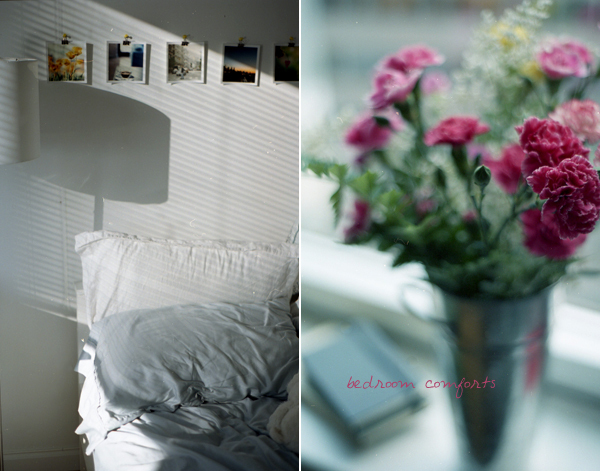 These were from the Portra 400VC roll. My windows face east so I am lucky to have streaming light like this. Per Se tomorrow. I have been looking forward to this for a very long time. You can obviously expect a (long) post on this to come. I am jealous of that light but even more so that you'll be going to Per Se! I can't wait to read all about it- I'm sure it will be so amazing! sigh- such beautiful dippy! LOVE your room!! the light is gorgeous and those pics on the wall are such a nice touch. My, my. You and your always awesome window light. Sounds like a place made just for you. Have fun! Beautiful photo wall display, lovely idea! i love that streaming light on the left! how gorgeous. And I love your photos, too - not just those from your room, but generally. I hope you can forgive me not commenting very often - please know that I'm a daily visitor of your blog. I adore the photos above your bed as well, gorgeous!